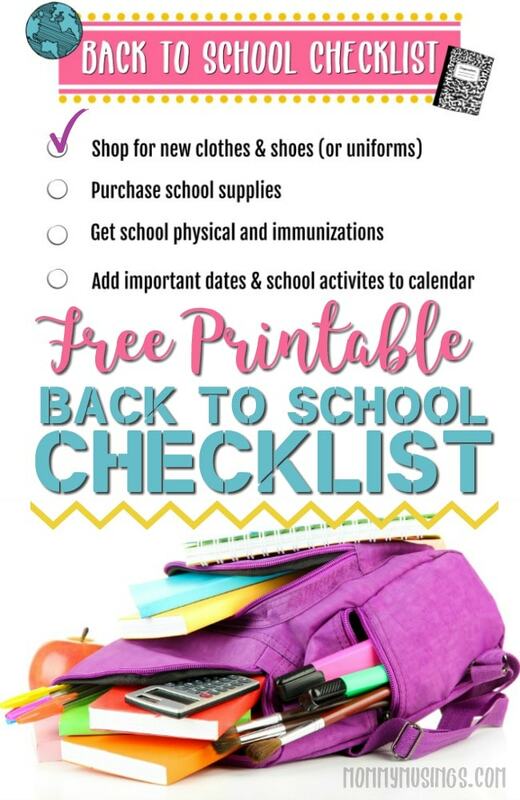 Get back to school ready with this free printable back to school checklist + get free enrollment, a savings of $50, on a new Florida Prepaid Plan until March 1, 2019, with code MUSE19. This post is sponsored by the Florida Prepaid College Board, through my role as a Believer Blogger. All thoughts are my own. It’s really hard to believe that back to school is already here— the summer just flew by! I have a bit of a love-hate relationship with back to school season because, on the one hand, I get a little extra free time in my day when my daughter is at school, and on the other, there’s just SO MUCH that goes into getting ready for the start of the new school year. It can all be very overwhelming! You’d think I would be a pro by now, but every year there’s always something that I miss. This year it was my daughter’s transcripts with her standardized test scores— I legit forgot to send the request to get them sent from her old school to her new one! 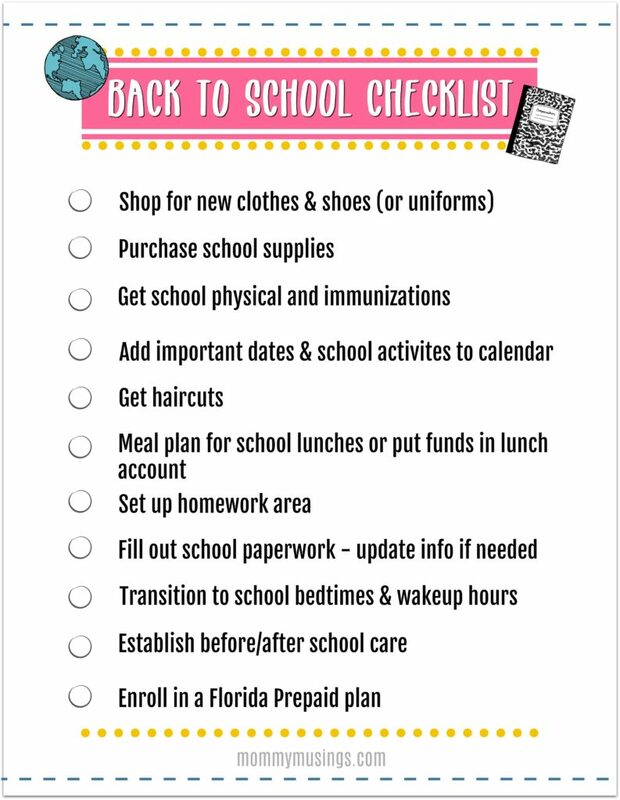 In an effort to make the back to school season a little less stressful, I made a back to school checklist for parents who are beginning this phase of life. My sister actually sparked this idea because she has two little ones who are entering kindergarten and first grade. This back to school checklist features eleven back essentials for the start of the new school year. 2. 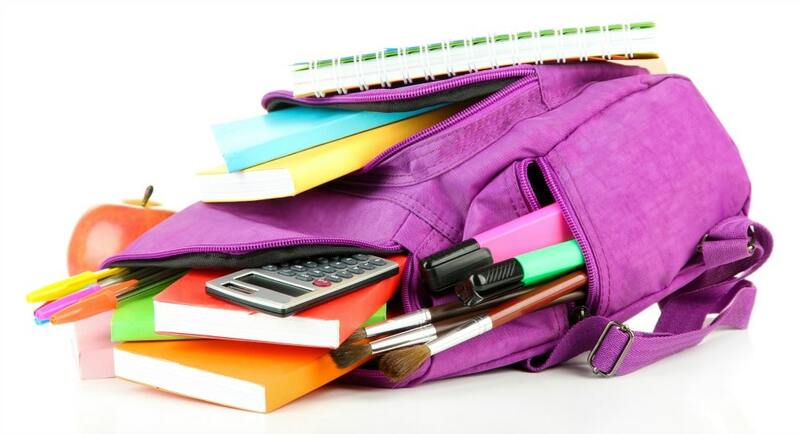 Purchase supplies from the school list – Check your child’s school website for supply lists by grade. 3. Get physicals and immunizations – Make sure to get a copy of these forms for school. 4. Add important dates & school activities to your calendar – Most important being no school days, holidays and spring break! 5. Meal plan for school lunches or put funds in lunch account – Knowing the foods your child enjoys in advance of the school year will save time and money. If your child is new to buying lunch have them try it out for a week and then let them decide if they want to take a packed lunch or buy one at school. Some schools even have free breakfast and lunch, so take advantage of that it’s an option! 6. Get haircuts if needed – I usually will schedule my own hair appointment with my daughter’s haircut. 7. Set up a homework area – It is essential for your child to get into the routine of doing homework every night. Setting up a dedicated spot with supplies will help them feel comfortable. 8. Fill out school paperwork and update info if needed – This goes for getting transcripts sent to new schools, change of address, health and medication info and parent pickup waivers. 9. Transition to school bedtimes and wake-up hours – Try to get your child on their school schedule a few weeks before the school year begins. 10. Establish before/after school care – Some after-school programs fill up very quickly, so make sure to enroll as soon as possible. Also consider carpooling with other parents in your neighborhood, taking turns taking and picking up each other’s children from school. 11. Enroll in a Florida Prepaid plan – It is never too early to start saving for your child’s future education! That last item on the back to school checklist is probably the most important. It’s easy to put off saving for your child’s college education because you think there’s so much time ahead of you. But, I’m here to tell you that those elementary and middle school years go by really fast. Like in the blink of an eye. 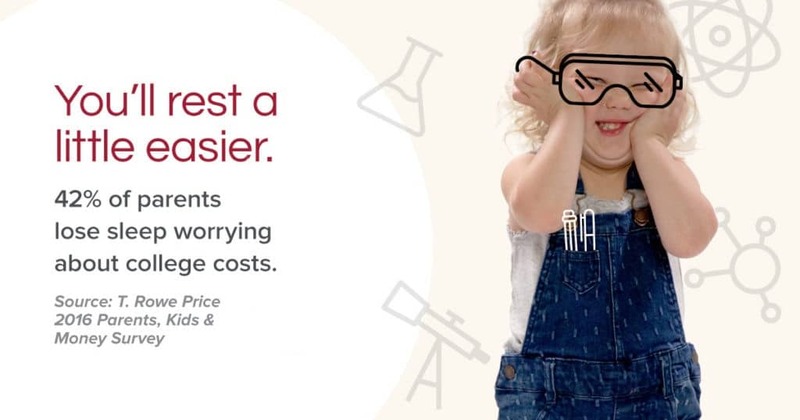 Florida Prepaid makes saving for college very easy, with plans available for every budget. Right now, just in time for back to school season, Florida Prepaid has a special promotion where they are waiving the application fee on new prepaid plans with Florida Prepaid promo code MUSE19 — that’s a savings of $50! Enrolling in a prepaid plan during this promotion means submitting an application that will be processed during the next Open Enrollment season. If you sign up during this time and you are not satisfied with your plan price when Open Enrollment begins, Florida Prepaid will help you select another plan or payment option to meet your goals and your budget. By enrolling in a Prepaid Plan now and securing a path to save for college, you can sleep a little better at night. A recent T. Rowe Price survey indicates that 42% of parents lose sleep worrying about college costs! 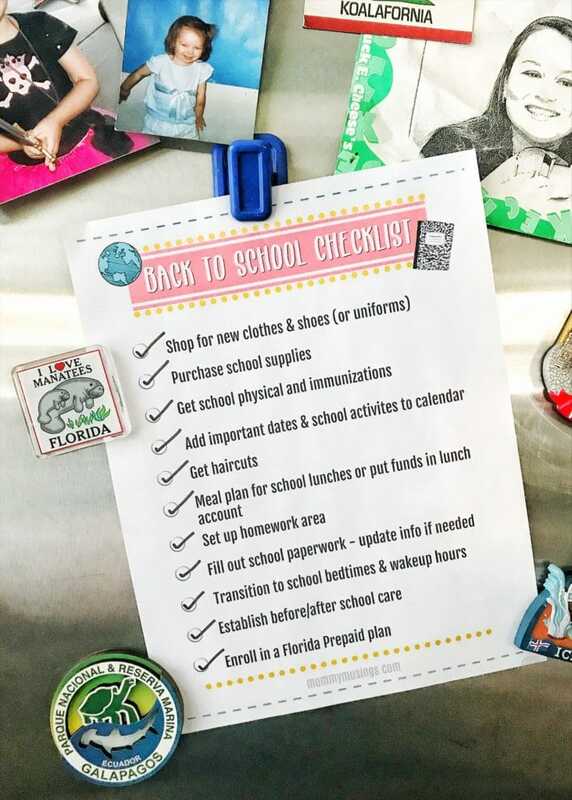 Learn more about making a Florida Prepaid College Plan part of your back to school checklist, and save $50 off the application fee with promo code MUSE19, at www.myfloridaprepaid.com/back-to-school. Think It’s Too Late to Start Saving for College? Not with Florida Prepaid! What is a Florida 529 College Savings Plan? My life would be so sorted, if I had this checklist in my school but thanks for posting it, still useful for my sibling.